Posted May 13, 2013 by Josette Farrell in News. 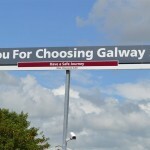 A new park-and-ride service between Galway Airport and Galway city centre starts on Monday 13th of May 2013. The service is being operated by Farrell Travel, under their BusLink brand. There is no service at the weekend (Sat–Sun) or on bank holidays. The TaxSaver scheme applies—provided your employer has joined it.